There was a positive reaction to the earnings release for Thomson Reuters as indicated by the gap and the close of $29.78. But the shooting star candlestick is a graphical representation of the selling pressure at the $30.00 resistance level. The stock opened at $29.75, rallied to $30.21 but closed at $29.78: practically unchanged from the open. The trend is everything in technical analysis. 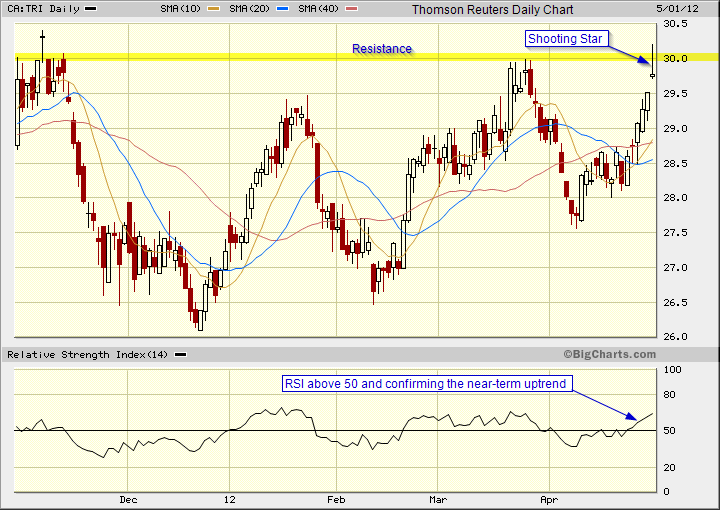 The major trend is down for Thomson Reuters, the intermediate trend is sideways and the near-term trend is up. A confirmed break (use the percentage and time filter) above resistance of $30.00 would indicate an intermediate target price of $33.00. If the stock cannot break resistance, it will continue to trade in the congestion zone with support around the $28.00 level. We are all students of the market and it can be a harsh teacher. Enjoy your trading day. This entry was posted in Stocks and tagged candlestick charts, resistance, shooting star on May 1, 2012 by Trader.